The Justia Lawyer Rating and Reviews system is intended to give consumers and attorneys a useful metric by which to evaluate and compare lawyers before deciding to hire or associate with them. The Justia Lawyer Rating and Reviews provide valuable insight from peers and colleagues personally familiar with the lawyer’s work. By quantifying this insight into a score between 1 and 10 based on reviews by other lawyers, we hope to add a level of ease and transparency to the process of finding a lawyer who may be a good fit for your needs. STEP 2: Our review committee researches the Attorney for the below criteria narrowing the nominations down to ensure that all the above criteria is met or exceeded. 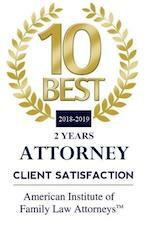 STEP 3: The list of the "10 Best" nominations goes to the final selection process where the 10 Best Attorneys representing the Best of the Best are selected. The Avvo Rating is our effort to evaluate a lawyer’s background based on the information available in an attorney’s Avvo profile. We create the rating using a model that considers information the lawyer has included on their profile in addition to information we collect from public sources like state bar associations and lawyer websites. Any information that affects the Avvo Rating is visible in an attorney’s profile. The Avvo Rating is based only on the information we have collected and that the attorney has provided, so we don’t recommend the Avvo Rating as the only piece of information you use to evaluate whether an attorney is right for you. The rating is a tool that provides a snapshot assessment of a lawyer’s background, and should be considered alongside other information such as client reviews and peer endorsements.